38 • March 2019 • S I G N & D I G I T A L G R A P H I C S DIGITAL PRINTING AND FINISHING DIGITAL GRAPHICS Working with transparency Stephen Romaniello is an artist and edu- cator and has taught digital art at Pima Community College in Tucson, Arizona, for over 28 years. He is a certified instructor in Adobe Photoshop and the author of numer- ous books and articles on the creative use of digital graphics software. Stephen is the founder of GlobalEye Systems, a company that offers training and consulting in digital graphics software and creative imaging. 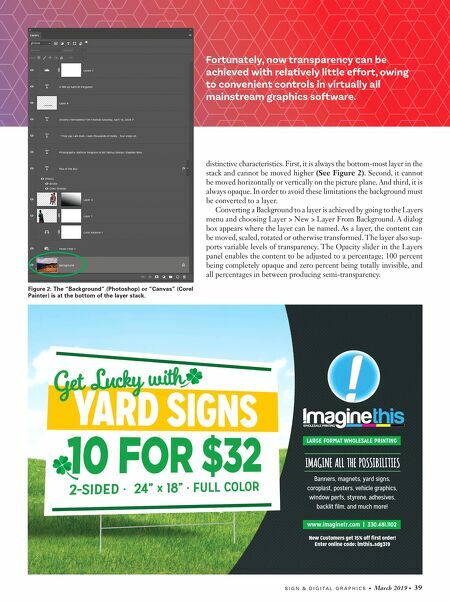 There is more than one reason to make graphic elements trans- parent; First: to be able to see through them; Second: To lighten and reduce their emphasis in the design field (see Figure 1) and to blend elements on consecutive layers to produce realistic composite effects. Let's discuss how transparency is achieved on images com- posed of pixels and look at some of the more creative applica- tions of transparency. Backgrounds First, let's examine at the mechanics of transparency. I will describe these features primarily using Photoshop, but Corel Painter is very similar with a slight variance in terminology. When a photo is captured with a digital camera or scanned and saved and opened in Photoshop, it resides on the layers panel as a single layer labeled "Background". (In Corel Painter it's called "Canvas.") A background is a specific type of layer that has three T he ability to control transparency is a special fea- ture in graphics software. Prior to computers, transpar- ency was an elusive feature in printed graphics achievable through the clever manipulation of optics, screens and expo- sures on a process camera. 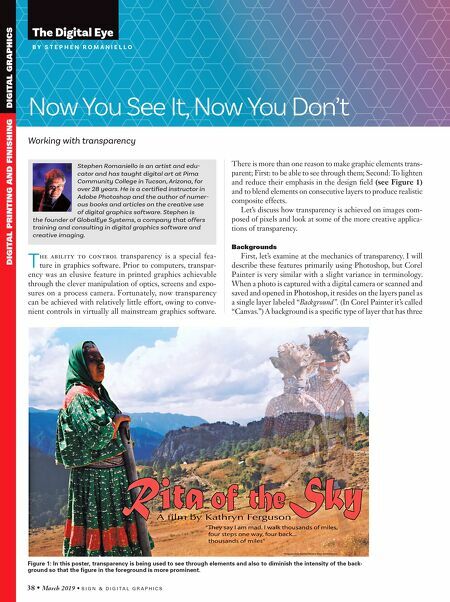 Fortunately, now transparency can be achieved with relatively little effort, owing to conve- nient controls in virtually all mainstream graphics software. B Y S T E P H E N R O M A N I E L L O The Digital Eye Now You See It, Now You Don't Figure 1: In this poster, transparency is being used to see through elements and also to diminish the intensity of the back- ground so that the figure in the foreground is more prominent.